The authors of this text have given mental health professionals a useful guide to navigate the coming of age of spirituality in clinical practice. While not the first of such books, the authors are in good company with other healing professionals (Council for Accreditation of Counseling & Related Educational Programs, 2009; Wiggins Frame, 2003; Young, Cashwell, Wiggins Frame, & Belaire, 2002) who have already developed competencies for addressing spiritual and religious issues in counseling. What sets this volume apart as an excellent addition to the literature is the research-based competencies upon which the book is structured. The book is organized in three parts: Attitudes (three competencies), Knowledge (seven competencies), and Skills (six competencies), under which each chapter elucidates the 16 spiritual and religious competencies the authors purport. Through a rigorous quantitative and qualitative analysis, the authors identify “the basic attitudes, knowledge, and skills that all psychologists and other mental health professionals should possess to be able to work at a baseline level of competence with their clients’ religious and spiritual diversity issues” (p. XIII). While noting that extant research recognizes the importance of religion and spirituality as aspects of human diversity and multicultural competencies, their inclusion into the Diagnostic and Statistical Manual of Mental Disorders (American Psychiatric Association, 1994, 2013) established that religious and spiritual issues are worth paying attention to in clinical practice. The book’s strengths are many in that the text focuses on the clinical acumen and competency of mental health professionals. By delving deeper into each competency (one per chapter), the authors provide exercises for practice and an inclusive appendix of resources, including books, websites, articles, videos, and training guidelines. All of these can supplement a practitioner’s professional and personal development or be used as an adjunct for teaching and curriculum in counselor education. Each competency and its activities are geared toward challenging the practitioner to become more aware of his or her own biases and assumptions as they relate to these issues; achieve greater tolerance for other religious and spiritual systems without judgment; and implement relevant and sensitive interventions strategies. Though not a comprehensive text on religion and spirituality, the authors’ focus is on delineating between competency and proficiency, and the book deals with developing the practitioner’s ability to do certain tasks in an appropriate and effective manner as qualified by his or her training. From an ethical perspective, the distinction is helpful, as counselors are not to practice outside of their area of competence. At the same time, this distinction can be debilitating, excluding a counselor (especially a new counselor) from working with any client, and confusing, unless the difference between competence and proficiency is clearly defined. In this book, the authors have engaged in this important dialogue as it applies to the context of religious and spiritual issues. The applications for counseling professionals are replete and the competencies explained in the book complement the values and standards espoused in the American Counseling Association Code of Ethics (2014), the Association for Spiritual, Ethical, and Religious Values in Counseling competencies (2009), and the Association for Multicultural Counseling and Development competencies (Arredondo et al., 1996), making this an excellent resource for professional counselors who want to gain greater competency to work with clients’ religious and spiritual issues. Vieten, C., & Scammell, S. (2015). 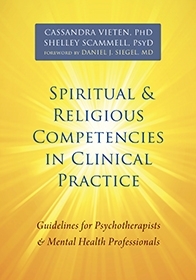 Spiritual and religious competencies in clinical practice: Guidelines for psychotherapists and mental health professionals. Oakland, CA: New Harbinger. disorders (4th ed.). Washington, DC: Author. disorders (5th ed.). Washington, DC: Author. Arredondo, P., Toporek, M. Brown, S., Jones, J., Locke, D., Sanchez, J. and Stadler, H. (1996). Operationalization of the Multicultural Counseling Competencies. AMCD: Alexandria, VA.
Association for Spiritual, Ethical, and Religious Values in Counseling. (2009). Competencies for addressing spiritual and religious issues in counseling. Wiggins Frame, M. (2003). Integrating religion and spirituality into counseling. Belmont, CA: Brooks/Cole. Young, J., Cashwell, C., Wiggins Frame, M., & Belaire, C. (2002). Spiritual and religious competencies: A national survey of CACREP-accredited programs. Counseling and Values, 47(1), 22–33.